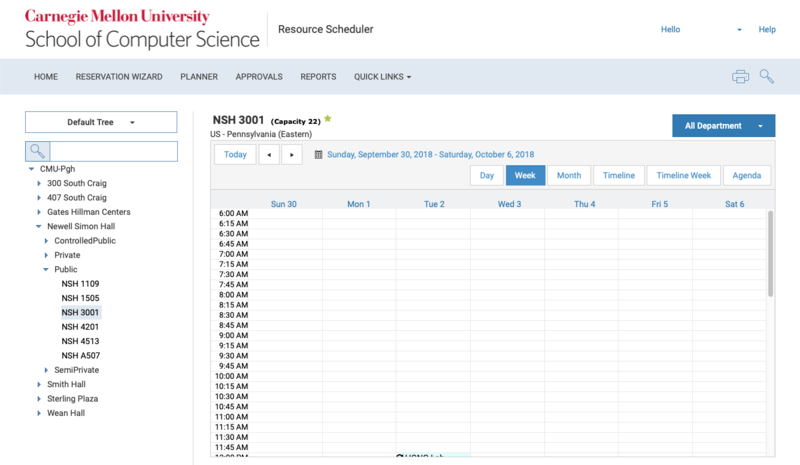 Resource Scheduler is a web-based system used to reserve the various types of rooms and resources available to the Carnegie Mellon School of Computer Science community. When prompted, please log in with your Andrew credentials. Pop-ups must be allowed in the browser for the Resource Scheduler site. Please use the links and buttons on pages to move between pages rather than using the browser "back" button. The "My Favorites" section shown here can display a list of rooms of your choosing. This will make it faster to book reservations in your most frequently used rooms. Immediately below, you will see the "My Reservations" section, which will display a list of your upcoming reservations. 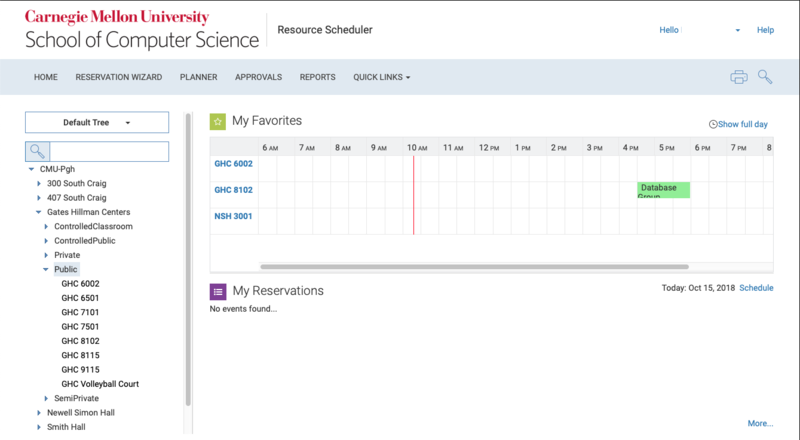 To make a reservation, use the list located in the left-hand sidebar of the Resource Scheduler homepage. To begin, click the drop-down arrow located to the left of the “CMU-Pgh” to reveal SCS buildings. Click the drop-down arrows next to the building and type of room to navigate to the space you would like to reserve or see more information about. From the sidebar options, click on the room of your preference. 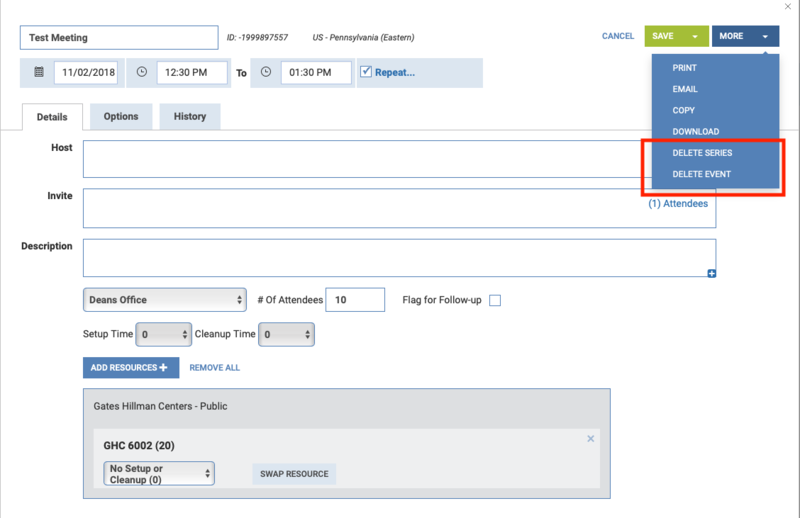 This will open it in “Schedule View.” Schedule View allows you to see a breakdown of the room’s schedule for your designated time period. Click on the time slot you would like to reserve while looking at your desired room in “Schedule View” and the “Quick Reserve” window will pop-up. 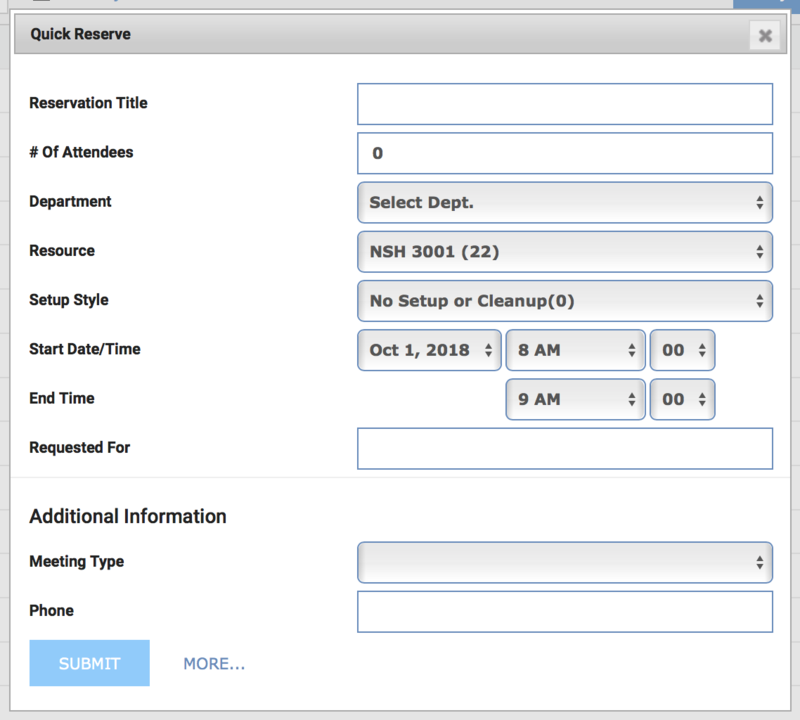 All fields in this window (with the exception of “Requested For”) are required to create a reservation. Complete the the Quick Reserve options and can choose the appropriate department from the drop-down menu. 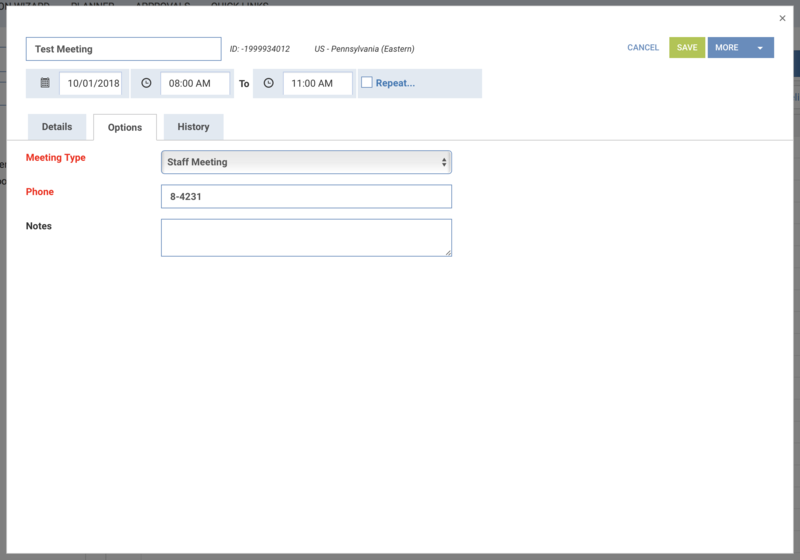 “Setup Style” refers to required setup and cleanup times for your meeting. Options available are shown here. 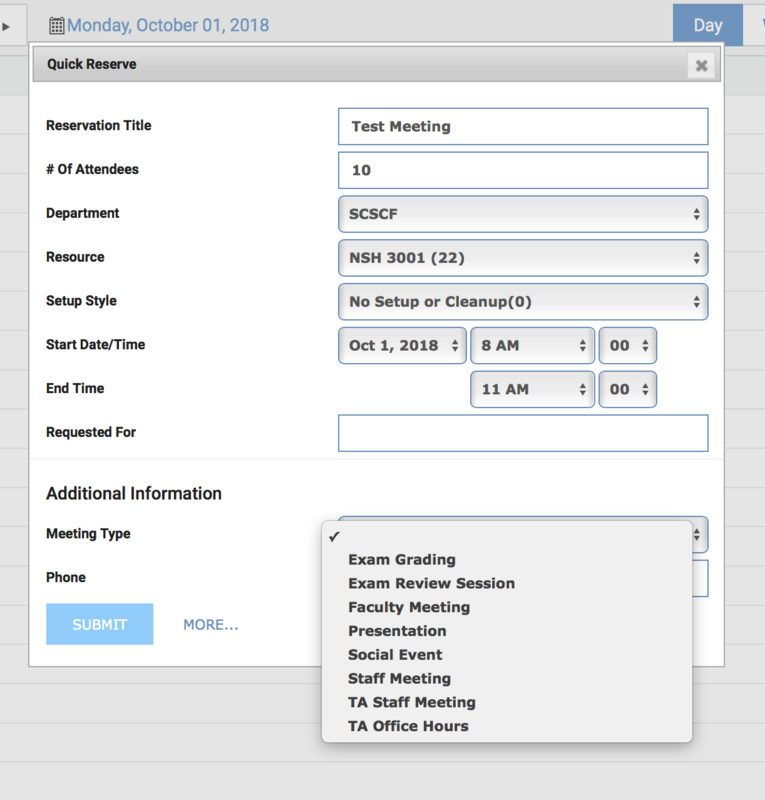 Choose the correct option from the available "Meeting Types" as shown. Meeting types have been defined in the SCS Room Use Policy. Click the blue Submit button to complete the reservation. Click the "More…" button to view additional options for reservations (including recurring reservation setup). 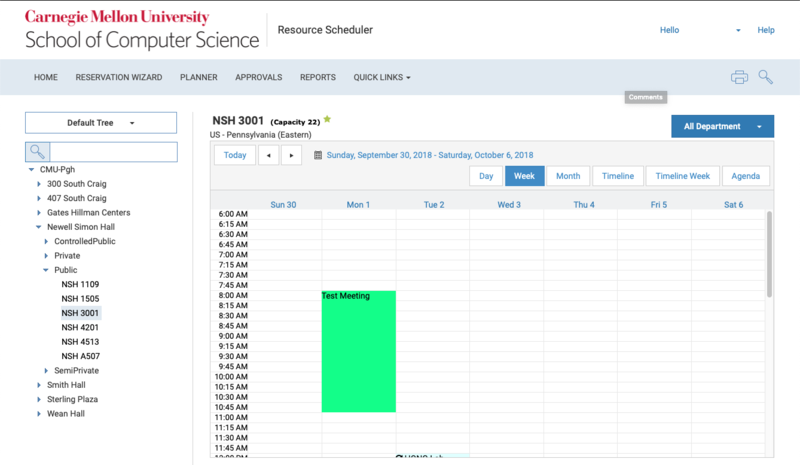 Once created, your reservation will now display on the Schedule View for the room in a color that correlates to the department chosen during the creation process. If you need to edit a meeting, click on the name of the meeting as seen here. 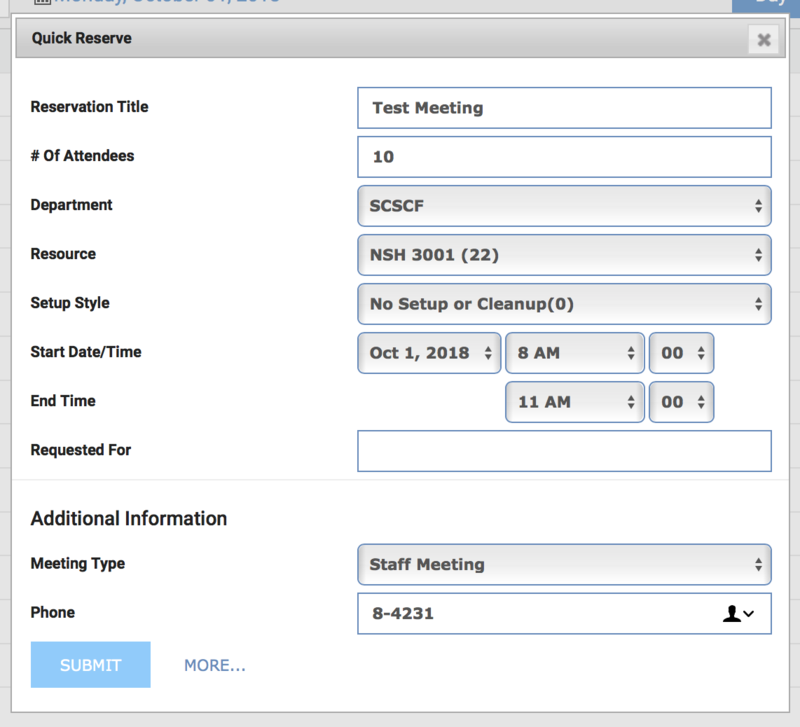 Click on the name of the meeting to reveal the Reservation Window and default to the Details tab. This same window that will appear when clicking on the "...More" button in the Quick Reserve window. This Details tab contains the ability to reassign a meeting to another user or add a host to your meeting. This is helpful if you are creating a reservation on behalf of someone else. 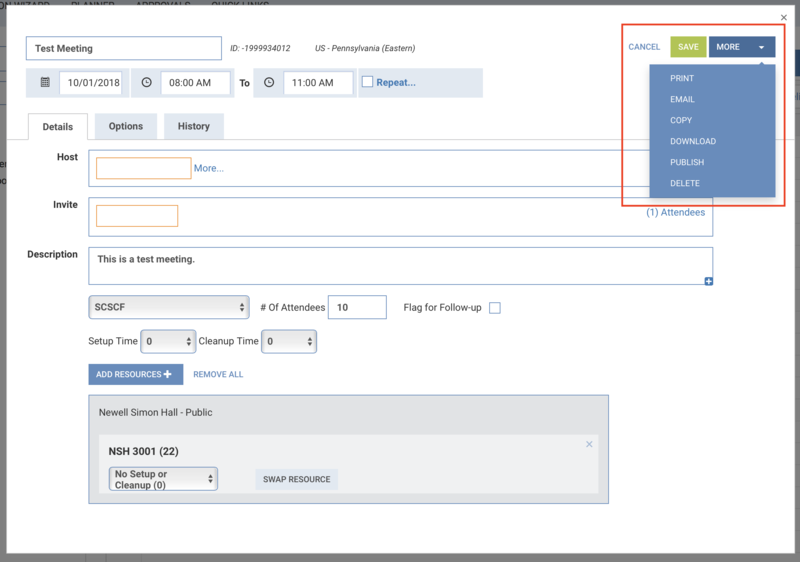 Selecting the Options tab will allow you to change the Meeting Type and Associated Phone Number, or add Notes if desired. The History tab will show a history of any changes to a reservation. To save any changes to your meeting, click the green Save button. 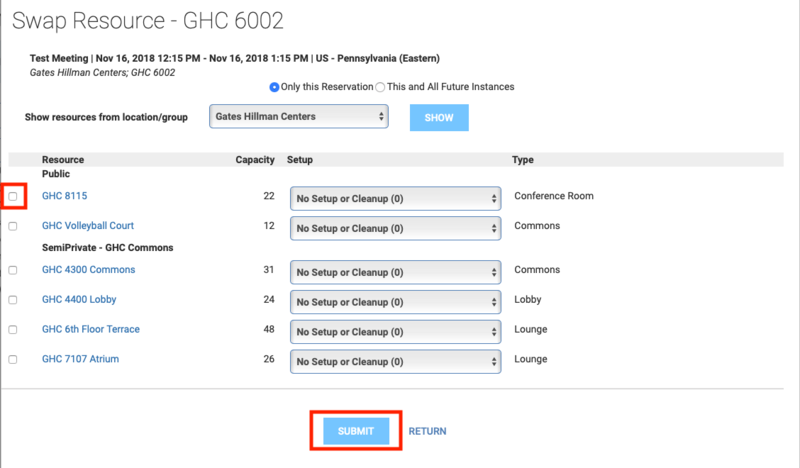 To configure recurring reservation options, select the "Repeat..." button. A new window with recurring options will appear. 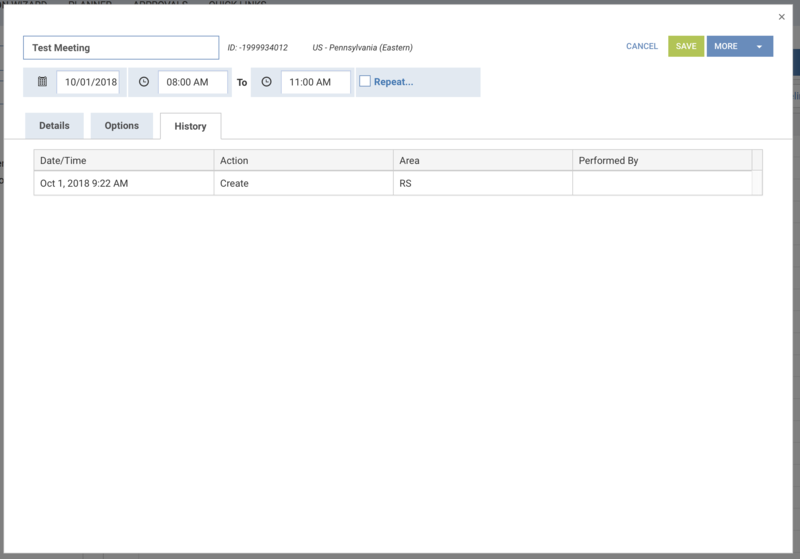 There are two ways to create recurring reservations: recurring pattern-based reservations and Ad-Hoc recurring reservations which do not follow any sort of pattern. 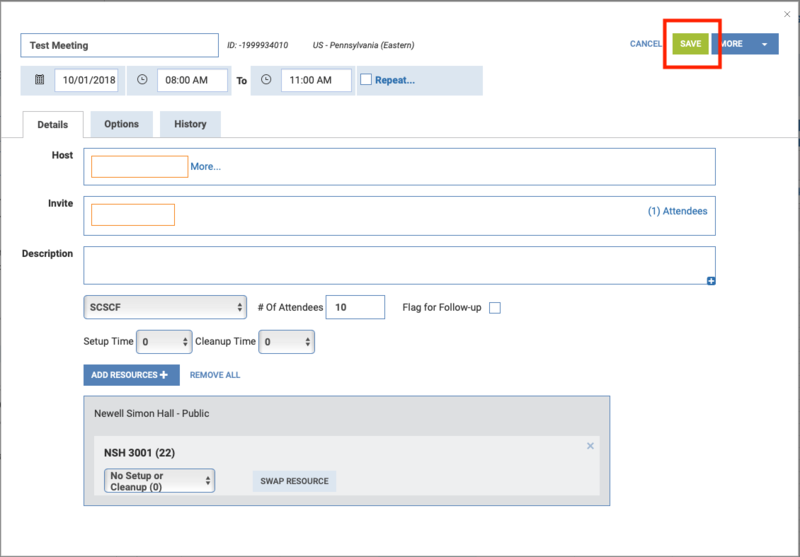 To create an Ad-Hoc recurring series, select the Ad-Hoc radio button. 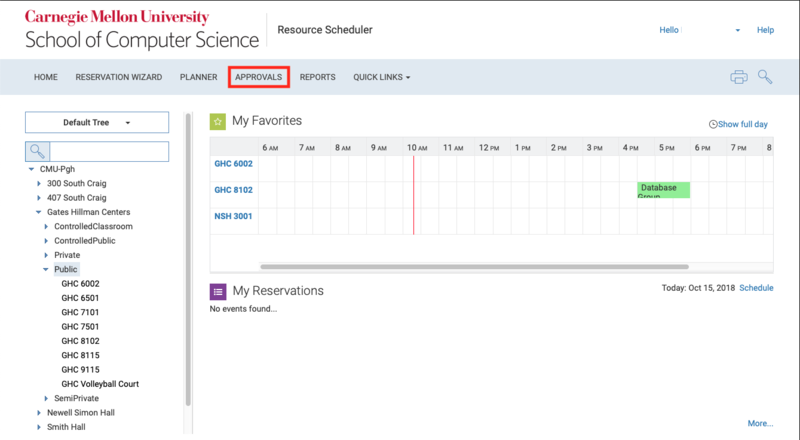 Then click the calendar icon to select a date for the next reservation in your series. 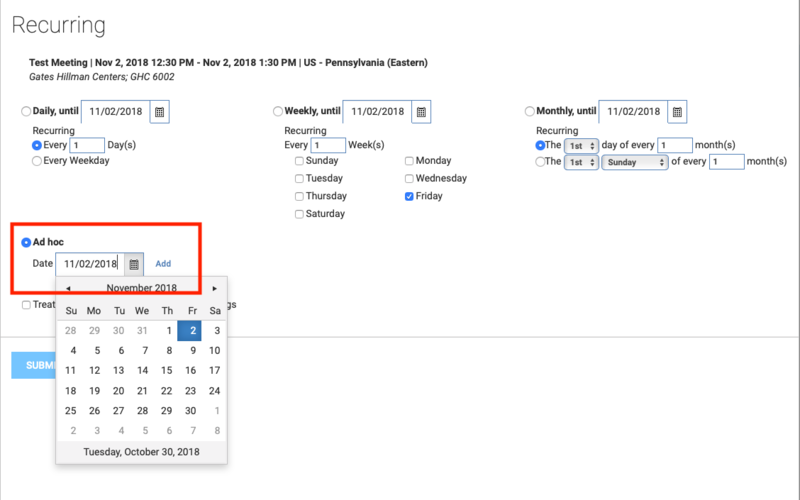 Once a date is selected, click Add to the right of the calendar button. All recurring reservations are limited by the time restrictions outlined in the SCS Room Use Policy. A list of Ad-Hoc recurring reservations will appear. 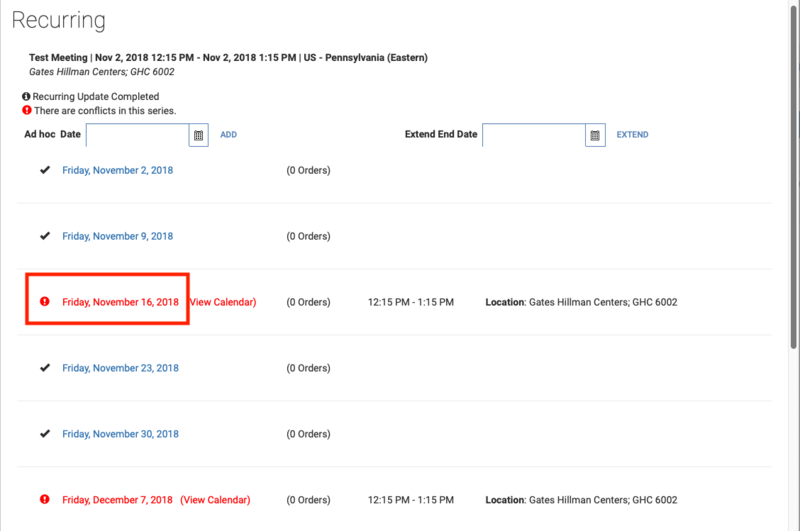 To add reservations to the series, select the calendar icon to the right of "Ad Hoc Date" to choose a date, then click Add. 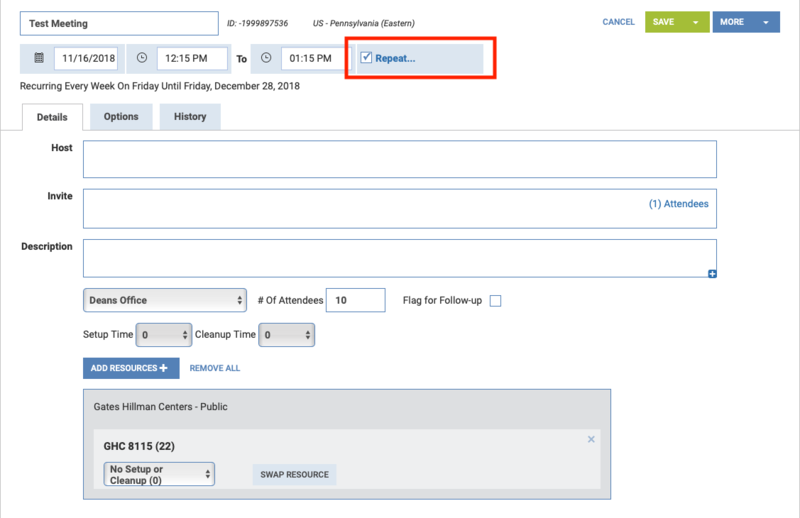 If you are presented with conflicts (these will be flagged in red), proceed to the pattern-based recurring reservation section below for information on how to resolve conflicts. When finished, select the Return button at the bottom left of the Recurring Settings window. 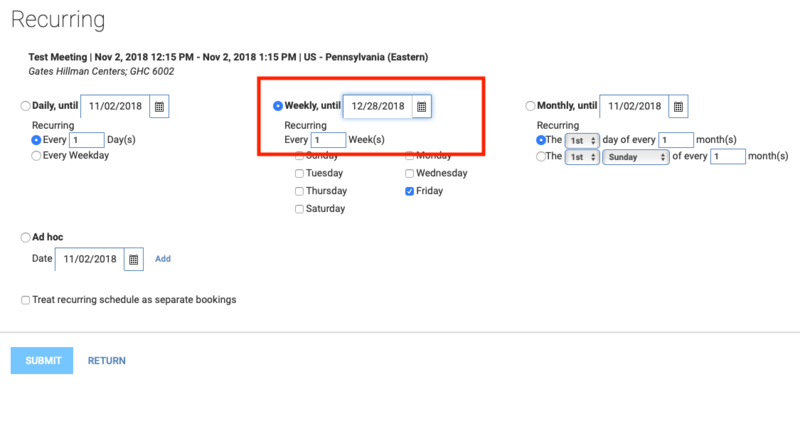 To create a pattern-based recurring reservation series, select the radio button for the desired recurring frequency. Then, select the calendar icon to the right of the chosen recurring frequency to enter in a date that the series will run until. Select the blue Submit bottom at the bottom left-hand section of the recurring settings window. If there are conflicts with the recurring reservation series settings, a pop up window stating this will appear after clicking the Submit button. 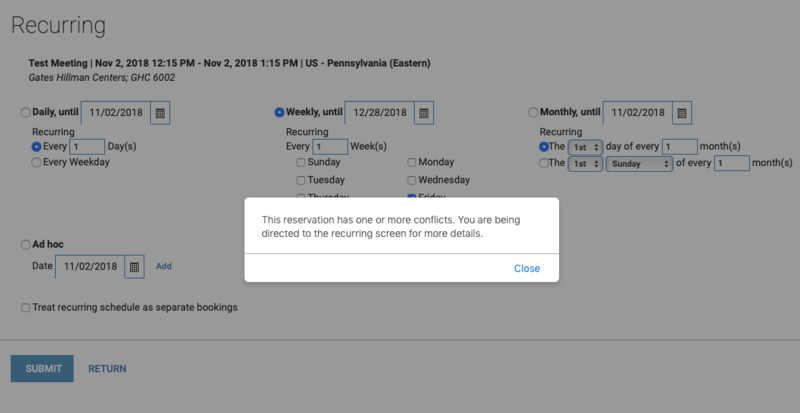 Clicking "Close" on the conflict notification pop-up window will lead to a list of the recurring reservations in the series, with the conflicts listed in red. To address the conflict, click the date of a conflict. 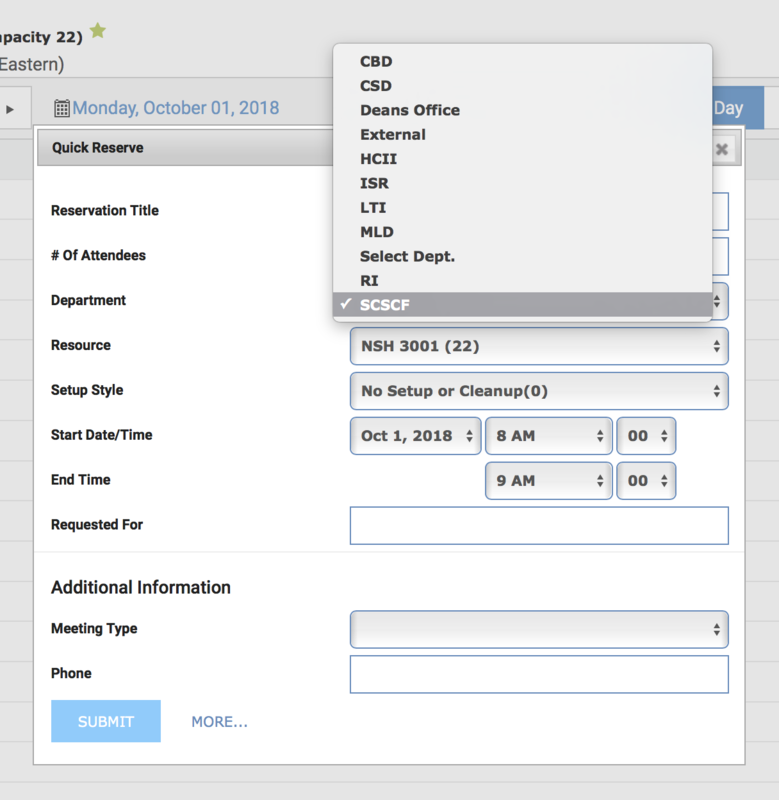 A new reservation settings window will appear, again showing the conflict issue (the room number) in red. To resolve the conflict, click the Swap Resource button to the right of the room number. The resource swap window will appear. Select the radio button for Only this Reservation to prevent further conflicts affecting other reservations in the series. 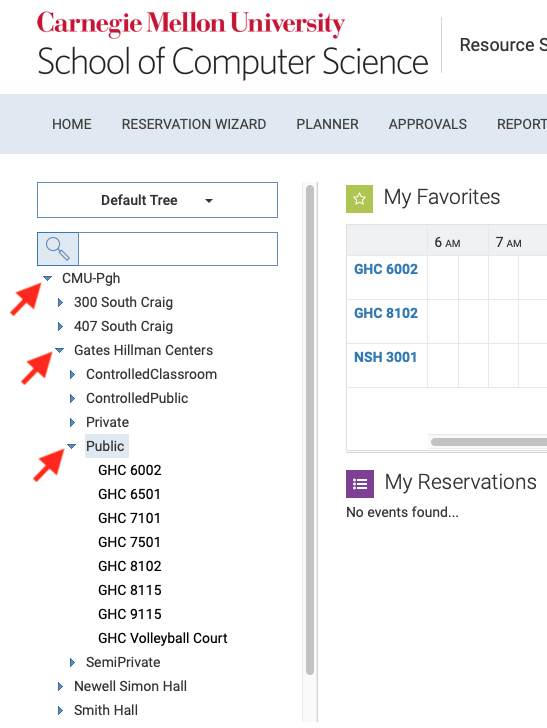 Click the drop down for resource locations to select a location to search for available rooms. Click the blue show button. A list of resources available for the desired time will appear. To select a resource for the swap, click the check box to the left of the room number, then click the blue Submit button. The reservation settings window will appear again showing that the initial room conflict was resolved. 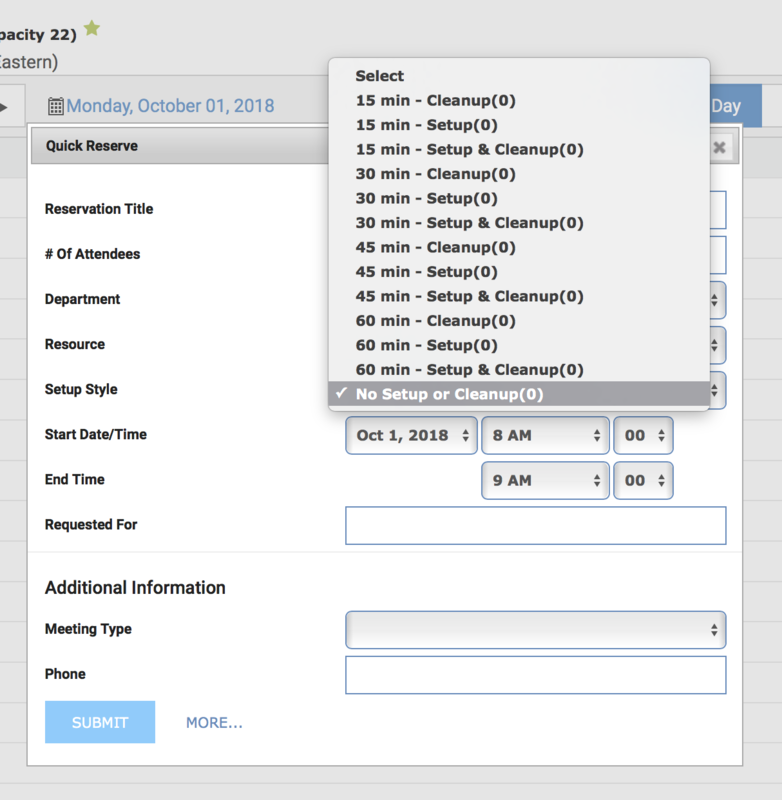 If there are additional conflicts in the reservation series, select the Repeat menu button again to be taken back to the series list to be able to resolve them. If there are no further conflicts in the series, select the green Save button at the top right-hand corner of the reservation settings window. Select "Only This Event" from the drop down to prevent issues occurring with the other reservations in the series. 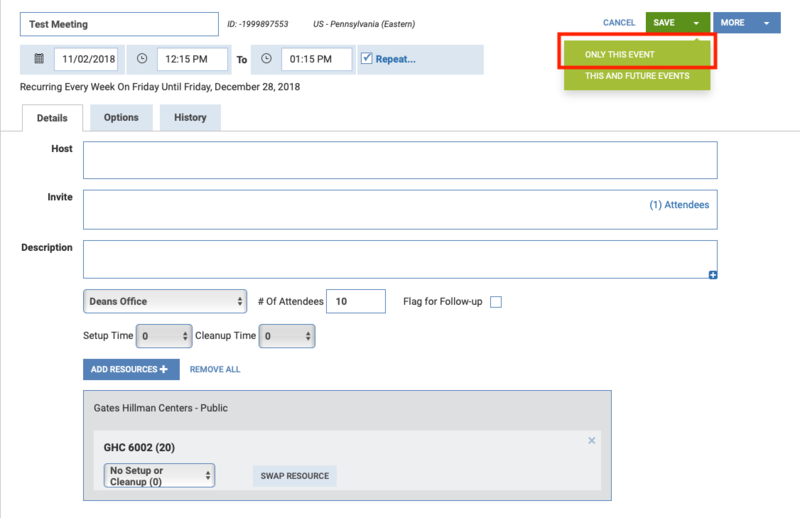 To cancel your meeting, click the dark blue "More" button in the upper right corner of the Reservation window, then click "Delete". 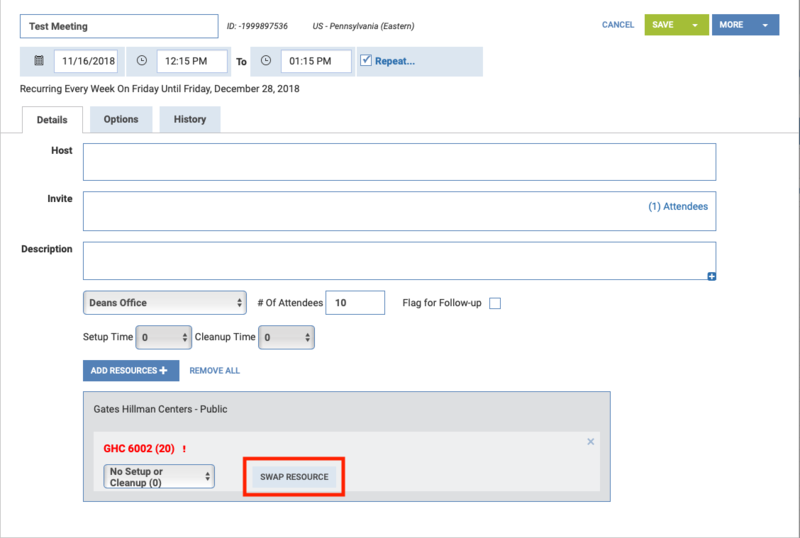 A confirmation window will appear to verify that you would like to cancel your meeting. To delete a recurring reservation, select the same dark blue "More" button. Select whether you would like to delete just that event or the entire series. A confirmation window will appear to verify that you would like to make the cancellation. Some rooms in SCS require moderation to ensure that they are being used according to the guidelines of the SCS Room Use Policy. This guide is for the individuals that have been designated as approvers for these moderated rooms. If you are a room approver (previously known as a "moderator"), you can view your list of reservation requests by clicking on the Approvals tab in the menu bar on the Resource Scheduler Homepage. Upon clicking the Approvals tab, you will navigate to your Approval queue page, where you can see relevant information regarding requests in your queue. To confirm, click the check mark button under the Action column. To decline, click the X button, also under the Action column.